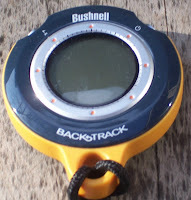 For years I resisted the GPS trend and stuck resolutely to my trusty compass when grouse hunting, but this year I came into at least the 20th century, and joined the woodsy, computer crowd. The change of mind was precipitated by an unscheduled walk last year during a hunt in the featureless eastern Upper Peninsula. I was hunting with a group guided by a fancy GPS system. We became separated, as usual , and I followed my compass, heading back to where I thought the truck was parked. Along the way, I took an extra 45 minute walk, quiet out of the way. I eventually got back to the truck, but I caused some concern for my son, who came looking for me. This year was different. My son bought me a Bushnell Back Track, a simple one purpose GPS system that’s easy to use, and at $70, fairly inexpensive. He’d found it in the L.L. Bean catalogue. When he gave it to me, I looked at it, hesitant to turn it on. But I plunged in, and was pleasantly surprised by how easy it was to use. There are only two buttons, one to turn on the power, and the other to mark your spot. I was using it within a half hour. You can mark four way points on the device, and it also has an electronic compass for back up. The Back Track served me well during our fall hunt, and saved me some walking. The only complaint I have about it is that the directional arrow on it, telling you which way back, is too sensitive to movement, and swings wildly at times while walking. I found that by standing still for a moment, and holding the device level, it would give me a true reading. However, the distance it read was always correct, and measured almost every step taken. It also has other uses. It works well as a car compass, and would be great for those looking to find their way back to the car in a crowded mall parking lot. Runners, bicyclists and cross-country skiers can also use them to determine how far they have traveled. Paddlers could also use it to find take out points, or negotiate backwaters.